2. The iPhone 5S Home Button replacement can support all the basic functions except for unlocking the iPhone with fingerprint. 1. When you open the screen assembly, in order not to break the home button flex, please use proper strength and the angles between the screen and the rear housing should be within 30 degrees. 2. After pry up the screen assembly, keep the angles between the screen and the rear housing within 90 degrees in order not to damage the flex cables. 3. 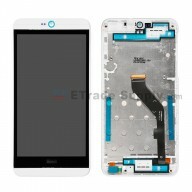 First unplug the front facing camera flex connector, then LCD screen flex connector, last the digitizer flex connector. 4. The flex cables should be bent a little bit before the installation, but do not use too much strength. 5. Do not force any strength on IC which located on the flex cable. 6. When connect the connectors, keep the angles between the screen and the rear housing within 90 degrees. 7. Plug the digitizer flex connector, LCD screen flex connector, front facing camera flex connector. Excellent replacement screen! Made for a quick repair and the unit still works great today! [ ETS Answer ] Thanks so much for your review and support.